SUBHEAD: There's no need for a non-stick pan when you have a well-seasoned cast iron pan. 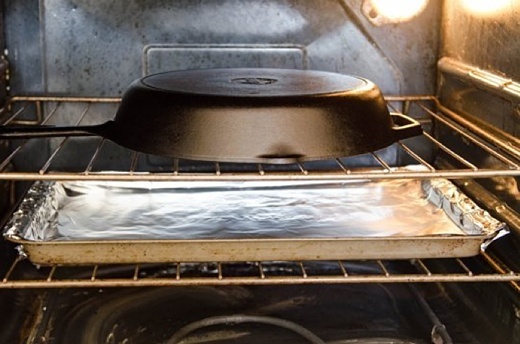 Image above: Seasoning a cast iron skillet in a 325º oven. From original article. In recent years, I fell in love with my cast iron skillet. It’s one of my most used kitchen tools. It’s the perfect vessel to cook up a great pork chop, crisp up some chicken thighs or even bake a great batch of brownies. I love being able to transfer things from the stovetop to the oven with ease. Oh, and they’re super easy to clean! You can use a cast iron skillet for most anything as long as you take the time to maintain it and keep it in good condition. I’m going to show you how to easily season your cast iron skillet and keep it in great working order! I know I mentioned I’ve only in “recent years” come to love cast iron, but there’s nothing new about this material. I’m sure most of you have memories of your grandparents or even great-grandparents lugging out their heavy-bottomed skillets and frying up dinner. There’s a reason these pans get passed down from grandparent to grandchild. There is science behind the seasoning process and the skillet’s durability! Learn how to maintain your pan, and it will last you a lifetime. Wash the skillet with warm, soapy water and a sponge or stiff brush. Cast iron should not normally be washed with soap, but it's fine here since the pan is about to be seasoned. Rinse and thoroughly dry the skillet. Using a cloth or paper towel, apply a thin coat of vegetable oil or melted shortening to the inside and outside of the skillet. Vegetable oil and shortening are the most commonly recommended oils used for seasoning, but according to Lodge, you can use any oil of your choice. Place the skillet upside down on the oven's center rack. Place a sheet of aluminum foil below the rack to catch any drips. Turn off heat and allow to the skillet to cool completely before removing from oven. Additional Notes: A seasoned skillet is smooth, shiny, and non-stick. You'll know it's time to re-season if food sticks to the surface or if the skillet appears dull or rusted. 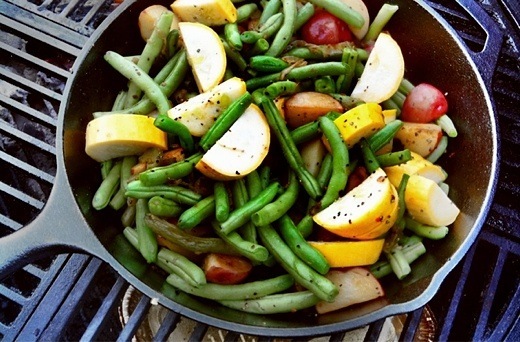 Image above: Cooking vegetables in a cast iron skillet. From original article. My favorite kitchen tool is an old cast iron frying pan that my dad gave me years ago. He found it in the woods, rusty and caked with dirt from sitting outside. I was skeptical, but my husband tackled the cleaning and seasoning of the pan with great gusto. After a few smoky hours of rubbing the hot iron with lard and baking it on, the pan was finally ready. That pan has gone above and beyond what I ever expected. Long gone is the Teflon pan I used to have, with its sketchy-looking scrapes and missing chunks of non-stick coating. I don’t miss it at all because the cast iron pan, if used properly, works just as well as a non-stick one. It even adds iron to one’s diet; anemics are told to cook their food in cast iron in order to benefit from the few milligrams of iron that leach from the pan with each meal. Never clean it with soap, and never use steel wool to scrub it. If you have some stubborn food, add a bit of water and heat until it softens, then use a stiff plastic brush to rub it, since that won’t destroy the seasoned surface. To get that non-stick effect, heat the cast iron first before adding anything. Add oil to the hot pan right before adding the food. This will result in perfect non-stick eggs that slip right out of the pan. Never shock a hot cast iron pan with cold water because it can crack. Don’t soak or leave a wet pan in the dish rack because this will promote rust. Always dry it over a low burner, then re-season with a quick wipe of shortening or vegetable oil on a cloth or paper towel before storing. All of this may sound like a lot of extra work, but the result is worthwhile. You’ll have an amazingly flexible pan that can sear, sauté, simmer, bake, and broil, and you’ll feel better knowing that your family is eating food prepared in an all-natural, non-toxic way. Petrolify - Are you on it?